Each year our NCEM Bible camps bring hundreds of First Nations people and the Gospel of Jesus Christ together in a natural setting. In NCEM we’ve implemented several types of camping programs, some more similar to traditional Native camping than others. There are family camps, out-tripping camps for teens, and week-long sessions for children. Here is a list of our camps and their locations. You will find more information about each Camp by following the links. Each Bible camp’s page includes contact information & application forms for children/youth/families to attend camp … plus information & application forms for those considering serving there. Some of our NCEM missionaries serve in First Nations Bible camps besides those listed at above. Please contact us for further information. 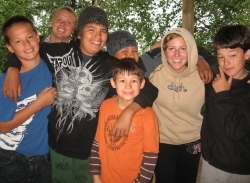 We believe Bible camp to be a great “seed planting” ministry, as God’s Word is planted in the hearts of First Nations young people. God’s love and Bible knowledge implanted in their hearts at camp can have immediate and long-range effects. To effectively conduct our Bible camps we rely on volunteers to serve as: cabin leaders, program directors, Bible teachers, cooks, maintenance helpers, and nurses. Summer workers may also assist in areas such as: waterfront, sports, crafts, and outdoor skills instruction. Summer opportunities range from 1 to 6 weeks. We try to keep camp fees as low as possible. The campers’ fees reflect only a portion of the total costs, so we rely on gifts from God’s people to keep our camps operating. Our Minute-Man donors are among those to give to camps and camp projects each year. Interested in serving at one of our Bible camps? If you are interested in working as an individual or bringing a team for one week or more, check out Serve at Bible Camp.